Day Two – Model answer to the question “what just happened”? This is my second “Learner Identity” posting and I realise I’m still setting the scene. Tomorrow I intend to tackle a biographical writing exercise related to reflecting on doing the PhD, but first I wanted to finish off the thoughts begun yesterday. One of these was an assertion that there is something not quite right in the present practice in the education or training of managers, and that although reflection is often referred to as being important, most of the time efforts to engage managers in the activity of reflection are often met either with varying shades of bemusement or with activity that reinforces the idea that reflection is all about finding better problem-solving habits. This shouldn’t be such a surprise. Very little of the factors that feed career success these days are reflective or require reflection, and few people have the luxury (or the framework) to sit back and ask themselves “what just happened?” when they are confronted by change. So professionally (and personally), one of the problems I’ve been contemplating over the last few months has been finding a better model for reflection in Personal Development than those mostly cited in business and management education and training. Here, most of the models for learning or reflection seem to focus on reflection as a stepping stone in a cycle from old experience to new experience, a stage which – once done – can be moved on from. Relection thus becomes something to be got out of the way. It’s terribly ‘touchy feely’, and even if they understand why it’s important, and even if it turns out to generate new viewpoints and choices for those that do engage with it. Although I enjoy confounding successful, mid-career and middle-aged managers by informing them that they all have a problem as managers, we usually end up framing (and demonstrating) this problem in terms of one or more of the “common” models, and these models fall short. Somehow, something remained missing because none of these models really unlock personal answers to the question “what just happened”? Then not long ago, in doing some research for a half-day session on reflection for a corporate client, I came across a some of the definitions and models for reflection that have been used in UK nurse training, and, boy, are they ahead of the vast majority of business schools! because it suggested that reflection (and therefore learning) begin with unsettling triggers, and we’re usually very good at not dwelling on those. 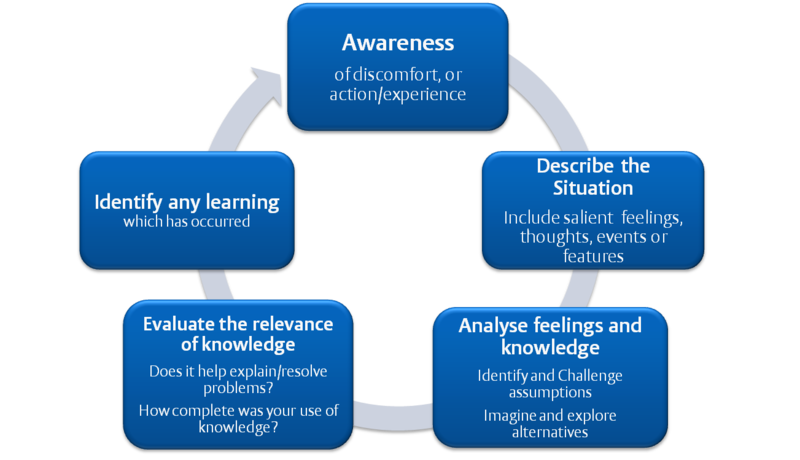 Atkins and Murphy’s (1994) model for Reflective Practice (below) was another find because it incorporated that idea of an uncomfortable trigger and provided a basis for acknowledging and involving the context, as well as thinking about the creation of new meaning that comes from just thinking about the event in the first place. A second thread of thought yesterday was on the question of identity. This really fascinates me, and I hope I’ll have a lot more to say on this. In fact, armed with what I hope are new ideas for me about reflection, it’s what I want these series of blog entries to be about, even when they don’t appear to be. Why am I doing a PhD? Is doing a PhD an act of identity formation? How does the question of identity get answered? Atkins, S. and Murphy, K. (1994) Reflective Practice. Nursing Standard 8(39) 49-56.